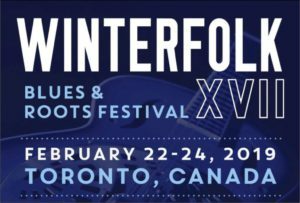 THURSDAY, JANUARY 24, 2019 – The 17th Annual Winterfolk Blues and Roots Festival,taking place in Toronto February 22-24, 2019, is set to present the best of urban, blues, rock, jazz, country, folk and roots music, and will feature returning favourite artists as well as fresh new talent. It’s an all-ages, mid-winter, weatherproof event that emulates a multi-stage rural summer festival. More than 100 artists will be performing at three venues and five stages over a three-day weekend. For more information on the festival, schedule and for updates, please visit www.winterfolk.com. delightful and skillful guitarist and performer. MARKS; Award-winning GARY KENDALL BAND; and two-time JUNO and seven-time Maple Blues Award-winning artist JACK DE KEYZER. Emerging and new-to-the-festival artists include: Brilliant Nova Scotian, now Toronto-based sisters CASSIE AND MAGGIE who offer Celtic fiddle and harmonies like honey; THE LIFERS, led by sisters Liv and Anita Cazzola, are an art-folk/rock collective from Guelph, Ontario, with harp-inspired ukulele, accordion swells, and lush vocal arrangements that give way to rip-roaring, soaring melodies and overdriven frenetic strums;Guelph’s award-winning folk duo TRAGEDY ANN inspires chills, provokes smiles, and reminds you to breathe.Mixing alt-blues and contemporary folk-rock, Liv Cazzola and Braden Phelan intertwine the storytelling power of Tom Waits with the musical nuance of Mandolin Orange; BLACK SUIT DEVIL plays “acoustic soul,” a fusion of folk, roots, blues and soul to give voice to social injustice and current political affairs; award-winning (opened for Brett Kissel), alt-country singer-songwriter ALESSIA COHLE; Kitchener native and multi- instrumentalist SAMMY DUKE performs as unique one-man-band; 2017 Songs from the Heart Contest winner, singer-songwriter DORIS FOLKENS plays old-time inspired folk and nostalgic tunes – all where the music beautifully transcends any age gap. Other newcomers include New York-based guitar ace LYNDA KRAAR; Australia’s soulful and honest, multilingual singer-songwriter STAV who shares her story of migration with bursts of rhythmic fire and soaring melodies; Toronto jazz vocalist SIMONE MORRIS exudes a rare blend of soulfulness and subtlety – a natural storyteller who artfully lures audiences into her craftily-spun musical stories; Toronto-based bluegrass outfit THE BARREL BOYS will keep everyone hopping and they’ll join hillbilly swing duo HOTCHA! plus singer and fingerstyle acoustic guitarist MR RICK for the annual and much-loved Americana Pie showcase. Accordion fanatics will love the very new accordion-driven trio SHAKE THE BELLOWS with their blend of Tex Mex, Cajun, Celtic and French waltzes. Laughton, David Storey, Roger Clown, Marg Stowe and James Gordon, will be a special ticketed showcase this year. everyone to enjoy. Winterfolk is a combination of general admission wristbands and separate ticketed concert stages on the Danforth, and is the ideal event for music-lovers seeking new and exciting things to do in Toronto.